A 60-Minute episode in which we discuss in which we discuss reading nirvanas, harsh feedback (and Kelsey’s bruised ego), Star Trek’s Dr. McCoy as a Victorian, and Balzac’s “The Grande Breteche.” Inspiration and cackling laughter abounds. This month we will be giving away a copy of The Queen of Blood by Sarah Beth Durst and a bunch of adorable succulent bookmarks – we will explain how to enter toward the end of the show. I asked Kaisha if she’d had any bookish nirvana moments since last we talked. Kaisha took a trip to Portland, Oregon with her book club. Portland is awesome. If you haven’t been to PDX and have the opportunity, you should check it out!! Powells Bookstore–you should check it out if you haven’t. Seriously. I could live here. So could Kaisha. Do you set book buying goals before you go out to buy books? Kaisha does. This time it was to buy whatever spoke to her as she browsed. Let us know about your book buying goals in the comment section! Kaisha wanted to read like she did when she was a kid, where she had no outlying agenda’s (blogging, recommending to customers, etc.). She wanted to get that wholehearted, engrossing experience that comes from entirely selfish reading motivations (that sounds nirvana-ish). Kaisha asked me about my current writing struggles in the midst of everything I have going on. If you are going to be a writer, you just need to make the time. 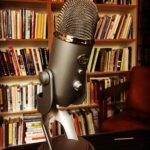 Some great articles on critiques, writing groups, and such. Can Critique Groups Do More Harm Than Good? Look up successful writers and check out their rejections. Above all else, just keep writing!! Synesthesia–describe the feel of an odor or the color of a sound, etc. If you are inspired by today’s prompt, consider submitting it to me on the “submit your work” page at tibetanlemon.com, and I might feature it on my website. Today’s short story is from Tellers of Tales by Somerset Maugham, “The definitive anthology of the short story” published in 1939. Balzac says, “Vocations which we wanted to pursue but didn’t bleed like colors on the whole of our existence.” See, even Balzac wants you to keep writing!! Balzac had a ton of failed attempts at writing. The first story he wrote and read to his family, they hated. He couldn’t get his first several books published. Takes place during The Peninsular War which began in 1807. France, with Spain as her ally opposed Portugal and England for ownership of the Iberian peninsula. But two years later, in 1808, Napoleon Bonaparte turned against Spain, and the war continued until 1815. As for being locked in a dark closet, Balzac was constantly in trouble in school and spent hour upon hour locked in the basement in his school. “On that spot I wove delightful romances, and abandoned myself to little debauches of melancholy which enchanted me. Ultimum cogita – Think of your end. Lol-the hobby aside–this dude needs a hobby! The lawyer’s little interruptions with the things he bought from the Countess. Great characterization. The contrast of the woman and the chateau. So he’s forgotten about his wife’s loveliness, and then remembers it when it is convenient. No wonder she went crazy–holy crap. Next reading if you want to read along: “The Gold Bug“ by Edgar Allan Poe. The Episode will post July 16th, 2017. 15 things you didn’t know about Bones. Kaisha is very sad that Victorian Era lit isn’t being read as much. Here’s a list so you can make her happy! Balzac demonstrates Realism in his writing. Don’t read Hardy’s Jude the Obscure. Actually, do, just prepare yourself for the gut punch he delivers.